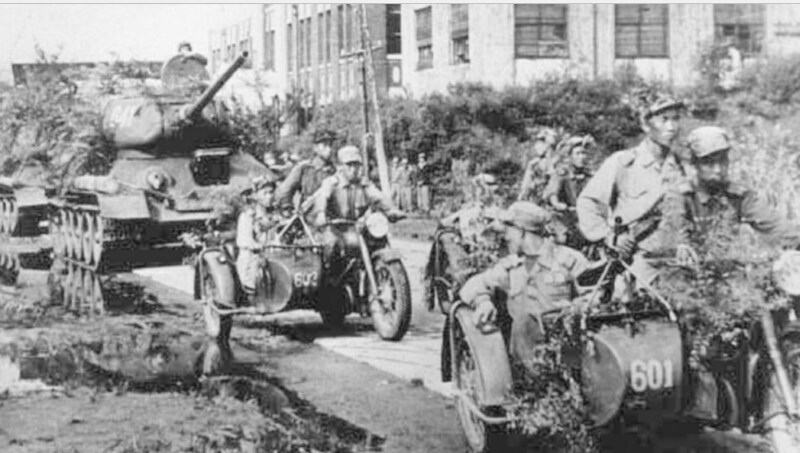 Camouflaged North Korean T34 tanks and motor cycle combinations enter Taejon city after the eviction of the US 24th Infantry Division. 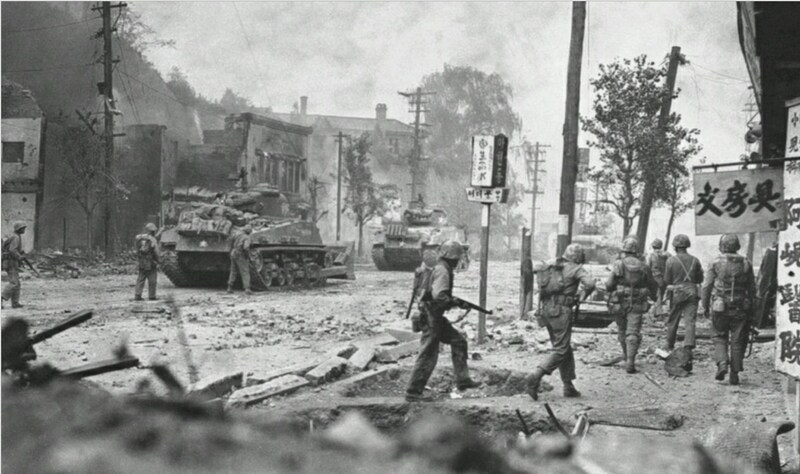 Marines from the 1st Marine Division entering Seoul accompanied by late-production M4A3 (HVSS) 105mm-armed Sherman tanks, the nearest of which mounts a bulldozer blade. 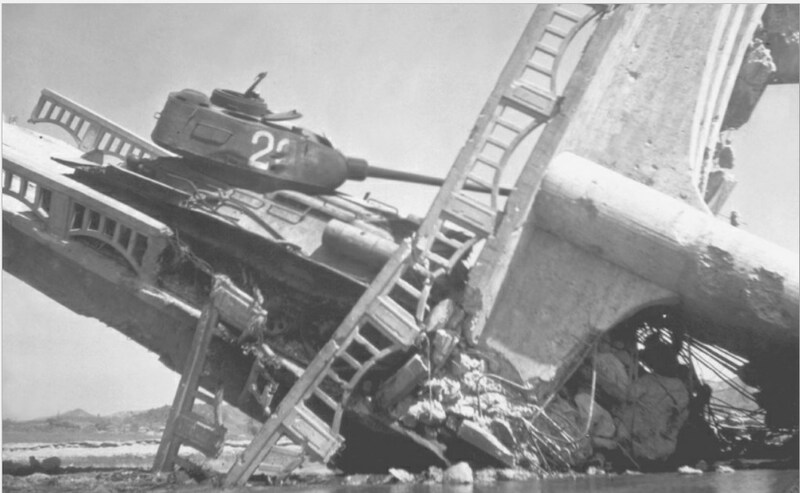 This North Korean T-34 was destroyed by the Air Force south of Suwon as it was crossing a bridge on 17 October. Following the defeat of the Japanese and the end of the Second World War, the Korean peninsula had been occupied in the North by the Soviet Union and in the South by the United States. The two halves of the country were partitioned at the 38th Parallel. In 1948 the Republic of Korea was established in the South, ruled by Syngman Rhee whose declared objective was the reunification of Korea as a non-communist state. A month later the Democratic Peoples Republic of Korea was established in the North, led by Kim II Sung. Elections should have been held to reunite the country, but never took place. By 1949 American combat forces had withdrawn from Korea, but left a military advisor group to assist the ROK army. The Soviet Union however, took an active role in governing North Korea and in early 1950 supplied weapons and several thousand soldiers to train the North Korean Army. Armed clashes were common along the 38th Parallel, but in 1950 US observers did not anticipate an invasion of the South. In January 1950 US Secretary of State Dean Acheson announced an American defensive strategy in the Far East that excluded both Korea and the Nationalist Chinese island of Formosa. It sent a clear signal to the DPRK that Syngman Rhee was on his own. Colonel Paik Sun Yup was fast asleep when the telephone rang. His breathless G-3 was at the other end: ‘The North Koreans have invaded! They’re attacking all along the parallel! The situation in Kaesong is chaotic, and I’m afraid the city already may have fallen.’ It was 0700 hours on Sunday, 25 June 1950. Colonel Paik was the commander of the 1st Republic of Korea (ROK) Division, protector of Seoul, the capital of South Korea. He was twenty-nine years old. He was also away from his 10,000-man division, on a senior officer training course at the Infantry School in Seoul. By the time Paik rejoined his division they were in contact with the 1st North Korean Division supported by tanks from the 105th Armoured Brigade. The 1st ROK Division was at the western end of the four divisions tasked with defending the 240 mile long imaginary line which was known as the 38th Parallel and formed the frontier between the two countries. Their section of the line was fifty-six miles long and impossible to defend, so Paik reduced it to nineteen miles by establishing his defences along the Imjin River. However, this meant that Kaesong was left open to the invaders and it fell within hours, with the 12th Regiment falling back in disarray. The 13th Regiment at Munsan was also involved in a pitched battle and the third regiment of the division, the 11th was called up from its reserve position. However, 50 per cent of its personnel were on leave and it would take time for the men to rejoin their unit. The 7th ROK Division was established to the east of the 1st ROK Division, but communications had broken down and their present situation was unknown. At the time of the invasion, South Korea possessed eight infantry divisions and four of them – 1st, 6th, 7th and 8th – were in position along the 38th Parallel. They were armed with American M1 rifles, 0.30-calibre carbines, 60mm and 81mm mortars, 2.36-inch rocket launchers and the M3 105mm howitzers. They had no tanks, no medium artillery and no fighter aircraft or bombers. The North Korean Army that attacked the South consisted of ten infantry divisions, eight of them at full strength with 11,000 men each plus one armoured brigade equipped with Russian T-34 tanks mounting an 85mm gun, an armoured regiment and two independent regiments totalling 135,000 men. They were equipped with 150 tanks, over 600 artillery pieces and 196 aircraft, including forty fighters and seventy bombers. Of the ten divisions, three were former Chinese Communist 4th Field Army divisions, 38,000 ethnic Koreans who had fought on the communist side during the Chinese civil war, so they were combat-hardened and efficient. The North Koreans had spent over 13.8 million rubles to purchase Soviet weaponry including 76mm and 122mm howitzers, 45mm anti-aircraft guns and 82mm and 120mm mortars. The invasion force comprised two Corps, both commanded by Koreans who had fought for Mao Zedung in the Chinese civil war. The commanders of the 5th, 6th and 7th Divisions were all veterans of the Chinese 4th Field Army and their men all brought their weapons with them when they crossed the Yalu River back into North Korea. During the afternoon of 25 June, North Korean aircraft attacked South Korean and United States Air Force aircraft and facilities at Seoul airfield and Kimpo air base, just south of Seoul. They left a C-54 transport aircraft burning at Kimpo and one of its crew became the first American to be wounded in the Korean War. The next day US Far East Air Force fighters based in Japan flew top cover while ships began to evacuate American citizens from Inchon, a seaport on the Yellow Sea, twenty miles west of Seoul. On the following day, 27 June, the UN Defensive Campaign formally commenced when Fifth Air Force fighters destroyed three North Korean Yak fighters, the first aerial victories of the war. The UN Defensive Campaign was the first of ten campaigns that would be fought the length and breadth of the Korean Peninsula over the next three years and the participants would be awarded medals accordingly. As the North Koreans began to push the ROK forces southwards and Seoul fell to the invaders, the United Nations voted to assist the Republic of Korea. The United States would take the lead and President Harry S. Truman ordered US air and naval forces to help counter the invasion. Within days advance elements of the US 24th Infantry Division were on their way from Japan to the port of Pusan in the south-east corner of the peninsula. The men were part of the occupation forces that had been in Japan for the last five years and they were inadequately trained, poorly armed and led by inexperienced officers. A small combat team from 1st Battalion, 21st Infantry Regiment was flown in to try to slow the North Korean advance. However, by the time Task Force Smith had arrived at Pusan airfield and boarded trucks for the drive northwards, the North Koreans had crossed the Han River and taken Suwon and were already on the way toward their next objective: Taejon. Lieutenant Colonel Charles Smith and his 400 men moved into their positions about eight miles south of Suwon, where the road ran through a saddle of hills. Supported by six 105mm howitzers and 140 artillerymen they dug in and waited with trepidation for the enemy to appear. At 0730 hours on 5 July the North Korean column came in sight, led by thirty-three T-34 tanks, spearheading the advance of the 4th Division. They were engaged by the howitzers, then the recoilless rifles and bazookas of the infantry. However, none of them managed to penetrate the armour on the tanks and by 0900 hours they had driven down the road and past the defenders. It would be another week before the first large 3.5-inch bazookas and their larger and more destructive shaped charges arrived from the United States. Now the main column came into view, led by three more tanks and when they got closer Smith ordered his men to open fire with mortars and machine guns. The North Koreans quickly disembarked and instead of attacking the defenders head on, began to outflank them. The artillery managed to destroy two of the tanks with anti-tank rounds, but as they only had six of them they did not last long. The normal high-explosive rounds simply ricocheted off the sides of the tanks. Anti-tank mines would have stopped the T-34s but there were none in Korea at that time. At 1430 hours Smith ordered his men to withdraw, but the withdrawal was disorganised and nearly all the heavy weapons and twenty-five wounded men were left behind. Intense enemy fire caused heavy casualties amongst the GIs and only half of them made it back to safety; the rest were either killed or captured. In the meantime Major-General Dean, the commander of the division had arrived at Pusan and he sent the 34th Infantry Regiment up to P’yongt’aek with orders to hold the line. Lieutenant Colonel Loveless had only been in command of the 34th for a month. He had been brought in to replace the previous commander, who had failed to improve the fighting qualities of the regiment. Not only were the companies under strength, with about 140 officers and men each, but their weapons were inadequate as well. Each man had either an M1 or a carbine with 80 or 100 rounds of ammunition – enough for about ten minutes of firing. There were no hand grenades either, essential items for close-quarter fighting. A third of the officers had seen combat during the Second World War, but only one in six of the enlisted men had any experience of combat. The rest were at best only semi-trained and averaged under twenty years of age. The men of the 1st Battalion stood in their water-logged trenches until dawn broke. They had earlier been told that Task Force Smith had been defeated and in the early hours they had heard the sound of the bridge behind them being destroyed, to prevent its use by tanks. It was bad for morale and when dawn broke and they saw a line of tanks and trucks extending as far as the eye could see, they were ready to run. They were also without artillery support and when the first tank shells began to explode around them, they climbed out of their foxholes and began to retreat back to P‘yongt’aek. The poor performance of the American soldiers was due to the post-war complacency of their commanders and hundreds would die because of it. In this case the 34th Infantry Regiment was a third under strength and the two battalions were ill equipped and poorly trained for the battles ahead. The blame for this went right to the top, from the divisions officers, to General Dean and the commander of the US Eighth Army General Walton Walker. Ultimately the buck stopped at the desk of General MacArthur whose primary concern at that time was the rehabilitation of Japanese society and that country’s economy. General Walker’s advance party established the headquarters of the US Eighth Army at Taegu on 9 July and the next day the 25th Infantry Division began to arrive. To the east of the country the South Koreans were carrying out a fighting retreat to prevent the enemy from outflanking the American forces. As the North Korean 3rd and 4th Divisions prepared to cross the Kum River and advance on Taejon, General Dean marshaled his forces to oppose them. The 4th Division was at half strength with 6,000 fighting men, but they also had fifty tanks. The 3rd Division had no tanks, but was up to full strength. The US 24th Infantry Division had 11,000 men on its strength, but there were only 5,300 at the sharp end. It would be a hard fought battle. On 19 July General Dean and the three regiments of the 24th Division prepared to defend Taejon. General Walker told him that he had to hold the town for at least two days, to allow the 25th Division and the 1st Cavalry Division to reach the front. It was easier said than done. The enemy had rebuilt the bridge over the Kum River, ten miles north of Taejon and started to move tanks and artillery across. By midnight the two enemy divisions had encircled the town and were establishing roadblocks to the south and east. General Dean and his aide had spent the night in Taejon and awoke to the sound of small arms fire. Amazingly, considering his heavy responsibilities, the General found a pair of bazooka teams and went out tank hunting. By the afternoon of 20 July, General Dean realized that the battle was lost and ordered the withdrawal of the remaining units. Towards evening the main convoy tried to leave the town but came under enemy fire. General Dean’s jeep took a wrong turning and soon came under fire. After sheltering for a while in a ditch, Dean and his party made it to the banks of the Taejon River. They hid there until dark and then tried to climb the mountain north of the village of Nangwol. Sergeant George Libby was in a truck which was hit by devastating enemy fire which killed or wounded all on board except Libby. He administered first aid to his comrades and flagged down a passing M5 artillery tractor and helped the wounded aboard. The enemy opened fire on the vehicle and Libby, realizing that no one else could operate the tractor, placed himself between the driver and the enemy, thereby shielding him while he returned the fire. Although wounded several times, Libby stopped to pick up more wounded and continued to shield the driver and return fire as they approached another roadblock. He sustained further wounds and died as his comrades reached friendly lines. For his courage and self-sacrifice he was posthumously awarded the Medal of Honour. As darkness fell on the hills around Taejon General Dean and his party paused for a rest. Dean decided to go off on his own to look for water for the wounded, but he fell down a steep slope and was knocked out. When he came to, he discovered he had a broken shoulder and was disoriented. Up above, the rest of the party waited for two more hours for Dean to reappear, then set off for the American lines. General Dean spent thirty-six long days wandering the countryside before he was betrayed by two civilians and captured. His weight had dropped from 190 to 130 pounds and he was to spend the rest of the war in solitary confinement. If that was not bad enough, almost 1,200 of his men had become casualties. Towards the end of July an incident took place that would lead to a review by the Department of the Army Inspector General fifty years later. Korean villagers stated that on 25 July 1950, US soldiers evacuated approximately 500 to 600 villagers from their homes in Im Gae Ri and Joo Gok Ri. The villagers said the US soldiers escorted them towards the south. Later that evening, the American soldiers led the villagers near a riverbank at Ha Ga Ri and ordered them to stay there that night. During the night, the villagers witnessed a long parade of US troops and vehicles moving towards Pusan. On the morning of 26 July, the villagers continued south along the Seoul-Pusan road. According to their statements, when the villagers reached the vicinity of No Gun Ri, US soldiers stopped them at a roadblock and ordered the group onto the railroad tracks, where soldiers searched them and their personal belongings. The Koreans state that, although the soldiers found no prohibited articles such as weapons or other military contraband, the soldiers ordered an air attack upon the villagers via radio communications with US aircraft. Shortly afterwards, planes flew over and dropped bombs and fired machine guns, killing approximately 100 villagers on the railroad tracks. Those villagers who survived sought protection in a small culvert underneath the railroad tracks. The US soldiers drove the villagers out of the culvert and into the larger double tunnels nearby. The Koreans state that the US soldiers then fired into both ends of the tunnels over a period of four days (26–29 July 1950), resulting in approximately 300 additional deaths. At the time of the incident, the South Koreans and their American allies were retreating before the North Korean advance. The roads were packed with refugees and amongst them were North Korean infiltrators. The US Divisional commanders had given orders to keep the refugees off the roads and generally relied on the Korean National Police to carry out the work. Sometimes they were too enthusiastic and shot civilians considered to be Communist sympathizers or infiltrators. Major General Gay, the 1st Cavalry Division Commander was alleged to have commented that he would not employ the National Police in his division’s area of operations. However, such decisions were being taken by higher authorities. On 26 July, the Eighth Army in coordination with the ROK government formulated a plan to control the movement of refugees, which precluded the movement of refugees across battle lines at all times, prohibited evacuation of villages without general officer approval and prescribed procedures for the Korean National Police to clear desired areas and routes. They also strictly precluded the movement of civilians during the hours of darkness. It was under these conditions that the above incident took place. The 5th and 7th Cavalry Regiments were withdrawing through the area at the time. An enemy breakthrough was reported in the sector to the north of the 7th Cavalry position and in the early hours of 26 July their 2nd Battalion conducted a disorganized and undisciplined withdrawal to the vicinity of No Gun Ri. They spent the remaining hours of 26 July until late into that night recovering abandoned personnel and equipment from the area where the air strike and machine gun firing on Korean refugees is alleged to have occurred. By that night 119 men were still unaccounted for. The 7th Cavalry relieved the 2nd Battalion in the afternoon of 26 July and reported an enemy column on the railroad tracks on the 27th, which they fired upon. On the 29th they withdrew as the North Koreans advanced, so for two days they had believed they were under attack. It was later proven that the Air Force were strafing to the south-west of No Gun Ri on 27 July, but they were mistakenly strafing the command post of the 1st Battalion of the 7th Cavalry, rather than the enemy. It was not the first instance of ‘friendly fire’ and it certainly would not be the last. Were the cavalrymen responsible for the civilian casualties? The review in 2001 could not establish for sure. However, the fact is that the American troops had been thrown into action straight from occupation duty in Japan, mostly without training for, or experience in combat. They were young, under-trained and unprepared for the fight they would wage against the North Korean Peoples Army. Many of their NCOs had been transferred to the 24th US Infantry Division and they were facing a determined assault by a well-armed and well-trained enemy employing both conventional and guerilla warfare tactics. In these circumstances some soldiers may have fired in response to a perceived enemy threat without considering the possibility that they may be civilians. By 5 August, the North Korean advance had ground to a halt, due to a combination of factors: air attacks by the Far East Air Forces, lengthening supply lines and stiffer resistance from the South Korean Army and the United States troops who were now arriving in force. The defenders were now occupying only the south-east portion of the country, in a forty- to sixty-mile arc around the sea port of Pusan. Another Medal of Honour would be awarded to Sergeant Ernest Kouma for his actions on 31 August and 1 September. The 2nd US Infantry Division had just replaced the battle-weary 24th Division when the North Koreans began to cross the Naktong River under cover of darkness. As they did so, Sergeant Kouma led his patrol of two M26 Pershing tanks and two M19 Gun Motor Carriages along the river bank to the Kihang Ferry near Agok. A heavy fog covered the river and at 2200 hours mortar shells began falling on the American-held side of the river. When the fog lifted half an hour later Kouma saw that a North Korean pontoon bridge was being laid across the river directly in front of his position. The four vehicles opened fire and sank many of the boats trying to cross the river. Kouma was manning the M2 0.50-calibre Browning machine gun in the tank turret when he was told over the field telephone that the supporting infantry were withdrawing. He decided to act as rearguard to cover the infantry and was shot in the foot shortly thereafter while reloading the tank’s ammunition. His force was then ambushed by a group of North Koreans dressed in US military uniforms. Kouma was wounded in the shoulder as he repeatedly beat back the attacking North Koreans. Eventually the other three vehicles withdrew or were knocked out and Kouma held the crossing site until 0730 hours the next morning. At one point the tank was surrounded and out of ammunition for its main gun and Kouma held them off with his machine gun, pistol and grenades. The tank then withdrew eight miles to the newly-established American lines, destroying three North Korean machine gun positions along the way. During this action Kouma had killed an estimated 250 North Korean troops. The defenders of the Pusan Perimeter would try to keep the enemy at bay while General MacArthur planned the second US campaign of the war: the UN Offensive Campaign, which would last from 16 September until 2 November 1950. The US Defensive Campaign ended on 15 September. The following day the fight back began with Operation Chromite, a daring amphibious landing at Inchon, a port on the west coast of Korea and far behind the enemy lines. The X Corps invasion force, numbering nearly 70,000 men, arrived off the beaches 150 miles behind enemy lines. It was the first major amphibious assault by American troops since Okinawa in April 1945. After a three hour naval bombardment, the men of the First Marine Division began to disembark from their landing craft at 0633 hours on the fortified Wolmi Island that protected Inchon harbour. It was defended by 400 men of the North Korean 226th Independent Marine Regiment, but by 0750 hours the island was in the hands of the US Marines. Because of the high tides, the landing on the Inchon shoreline did not take place until the afternoon when the 1st and 5th Marines approached Red and Blue Beaches at 1733 hours. Most of the men had to scale the seawall with scaling ladders before assaulting the two objectives in front of them: the Cemetery and Observatory Hills. By midnight the beachhead was secure at the cost of twenty Marines killed and 174 wounded. In the morning the two Marine regiments began to move inland, driving the North Koreans before them. The 7th Infantry Division would begin to land at Inchon the following day as the 5th Marines began its drive towards Kimpo airfield. The first Marine aircraft began to fly sorties from the field on the 21st. The enemy suffered heavy losses that day, trying to cross the Han River into Seoul. They were caught in the open with nowhere to hide and the Marine Corsairs made run after run on them, with napalm, bombs, rockets and 20mm cannon. The Air Force’s contribution to the invasion was Air Interdiction Campaign No. 2, the first objective of which was to limit the flow of reinforcements to the landing zone at Inchon. The FEAF B-29s would also have to hit the rail yard at Seoul in the days before the landing and General MacArthur made it clear that he would require heavy air support for Eighth Army as it broke out of the Pusan Perimeter in pursuit of the North Koreans. The Eighth Army had been reorganized into I Corps and IX Corps. The most reliable units were allocated to I Corps: the 5th Regimental Combat Team, the 1st Cavalry Division, the rebuilt 24th Division, the 27th British Commonwealth Brigade and the South Koreans’ best division, the 1st ROK Division. They were to break out of the Pusan Perimeter and spearhead the 180-mile drive north to meet up with Major General Almonds X Corps which was coming ashore at Inchon. IX Corps and its 2nd and 25th US Divisions would follow on a week later. On the east side of the country the ROK I and II Corps were to engage the enemy the best they could. The breakout of Eighth Army was to begin on 16 September with a force of eighty-two B-29s bombing a pathway along the line Taegu-Taejon-Suwon. However, the weather delayed the attacks until 18 September when forty-two B-29s started to clear a path for the 38th Infantry Regiment to cross the Naktong River. This was followed by 286 close air support sorties from F-51s, F-80s and B-26s. A further 361 were flown the next day, halting North Korean counter attacks and weakening their defences until, on 22 September, the North Korean Army collapsed, leaving the door open for a race to the 38th Parallel. Bomber Command pursued the retreating North Koreans and attacked them by day and night. The B-29s had been practising dropping flares at night, so that B-26s could attack the targets illuminated by the flares. On 22 September the roving B-26s bombed and strafed a long North Korean ammunition train south of Suwon and the explosions went on for an hour. Other B-29s flew psychological warfare missions dropping leaflets over retreating North Korean columns. Many prisoners surrendered with these leaflets in their hands. As the bombing effort switched from the south to the north, the B-29s ranged far and wide looking for new targets. On 22 September a B-29 from the 98th Bomb Group spotted a town with a rail marshalling yard and bombed it. Several days passed before the Air Force managed to identify the town and discovered that it was actually Antung, across the Yalu River in Chinese Manchuria. The warning to stay clear of the Chinese border went out to the bomber crews and four days later attacks began against the North Korean hydro-electric plants, the first target for the 92nd Bomb Group being the electric plant at Hungnam. On the same day, UN forces fought their way into Seoul and began four days of street to street fighting to evict the 20,000 North Korean defenders. When Seoul finally fell on 28 September the total US casualties for the Inchon-Seoul operations had reached 3,500. Enemy casualties were estimated at 14,000 killed and 7,000 captured. On 27 September, MacArthur received authorization from the Joint Chiefs to send his forces across the border into North Korea and on 1 October all bombing in South Korea ceased. The same day the first South Koreans crossed the 38th Parallel, heading north. By now there were four US Army Divisions and a Marine Division in action. The first major Allied contingent had arrived in the shape of the 27th British Commonwealth Brigade and the 90,000 ROK troops were now receiving the weapons and training they sorely needed two months earlier. On 7 October the UN General Assembly approved a US-sponsored motion that stability be restored on the Korean Peninsula, by defeating the North Korean forces and restoring democracy to both sides of the border. MacArthur met President Truman at Wake Island a week later and informed him, although there were intelligence reports of Chinese forces massing across the border, he considered it safe to pursue the North Koreans right up to the Yalu River. In the meantime the Marines had been recalled to their ships and had sailed south around the bottom of the peninsula and up the east coast to the port of Wonsan. By the time the Navy had cleared the enemy mines from the harbour and the Marines had come ashore, the UN forces had swept past the town with the enemy in full retreat. The race for the North Korean capital of P’yongyang was under way. Three ROK divisions were driving northwards, together with the US 1st Cavalry Division, the 24th Division and the 27th British Commonwealth Brigade. On 19 October units of the 5th Cavalry entered P’yongyang, just minutes ahead of the ROK 1st Division. With the fall of their capital, North Korean resistance began to increase. On 20 October, 2,860 paratroopers from the 187th Regimental Combat Team and 300 tons of supplies were dropped near Sukchon and Sunchon, thirty miles north-east of P’yongyang. One of their objectives was to halt two North Korean trains full of American prisoners of war that were heading for POW camps along the Yalu River. They arrived too late and found that many of the prisoners had been murdered by their guards at the side of the railroad tracks. At the same time Fifth Air Force began reporting increased enemy air attacks along the border. The new Russian Mig-15 fighter had made its debut, flown by Russian and Chinese pilots and it outclassed all other jets being flown by UN squadrons at that time. MacArthur wanted bombing missions flown against the bridges crossing the Yalu River, to prevent supplies coming in to North Korea and to block the path of retreat for the North Koreans into Manchuria. However, at the time the Air Force was prohibited from flying within five miles of the Manchurian border. Originally, the Joint Chiefs only approved the use of South Korean units north of the 38th Parallel, but MacArthur ordered all of his forces to advance with all possible speed. He was taking a considerable risk and did not fully appreciate the possible reaction of the Soviets and Chinese as the UN forces approached their borders. On 26 October, advance units of the 6th Division of the ROK III Corps reached the Yalu River. Over the radio came the first reports that they had killed a small number of Chinese troops. At the same time the ROK 1st Division captured Chinese prisoners at Sudong. The next day, 27 October, the Chinese first-phase offensive was launched.